It is part of the monumental city of Thebes, it is also the largest temple complex ever built by man, and represents the combined achievement of many generations of ancient builders. Temple of Karnak is in fact a whole city of temples that were constructed over two millennia ago. The area around Karnak was the ancient Egyptian and the main place of worship of the eighteenth dynasty Theban Triad with the god Amun as its head. It is part of the monumental city of Thebes. Although badly ruined, no site in Egypt is more impressive than Karnak. 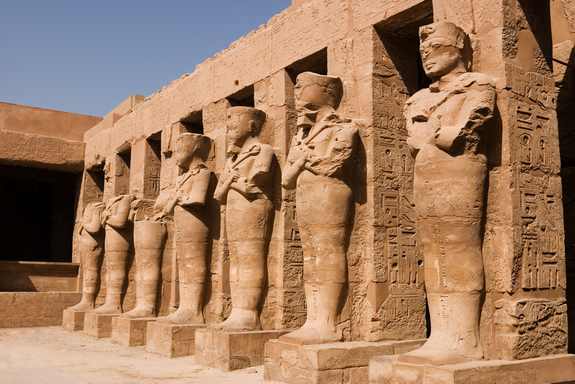 The history of the Karnak complex is largely the history of Thebes and its changing role in the culture. Religious centers varied by region and with the establishment of the current capital of the unified culture that changed several times. The great temple at the heart of Karnak is so big; St Peter's, Milan and Notre Dame Cathedrals could be lost within its walls. The Temple of Karnak is actually three main temples, smaller enclosed temples, and several outer temples located about three kilometers north of Luxor. Karnak is actually the sites modern name. Its ancient name was Ipet-isut, meaning "The Most Select (or Sacred) of Places". If you don't have the energy to cover all that ground then don't miss the Hypostile Hall in the Great Temple of Amun. There are several performances of the sound and light show a night with mixed reviews, but mostly good. Most probably this spot was the site of an old Temple, dating back to the time of the Middle Kingdom. 12 Day Dubai Egypt Package Trip, Dubai Abu Dhabi Egypt Nile Cruise Sightseeing Tour to Pyramids, Luxor, Aswan, Dubai & Abu Dhabi. Book Dubai and Egypt Nile Cruise Package to Relish An Amazing Middle Eastern Experience Full of History and Magnificence. Budget Trip to Egypt Package 8 Days. Travel to Egypt Tours to Cairo, Giza Pyramids and Nile Cruise Egypt Tours. Book 8 Day Egypt Small Group Tour Package Traveling Around Egypt Sightseeing Places and All Inclusive Nile Cruise Luxor Aswan. Cheap Nile Cruises All Inclusive. Book 4 Nights 5 Days Nile Cruise Luxor Aswan onboard 5 Star Superior Nile Cruise Ship. Book Affordable Nile Cruise Exploring Egypt Historic Sites on the Nile Banks Within Budget and All Comfort. Best Luxor Egypt Vacation Deal. 4 Day Luxor Aswan Abu Simbel Tour Package, One of the Best Luxor and Aswan Tour Itineraries With Hotels, Sightseeing and Tour Guide. Book 4 Day Tour Luxor Aswan Abu Simbel Top Historic Attractions in Egypt Online Now! 3 Day Luxor Private Tour Package. Luxor Itineraries For 3 Days to The Valley of the Kings, Karnak and Luxor Temples. Book Escorted Egypt Luxor Private Tour Package With Expert Tour Guide of Your Language, Sightseeing Tours and Hotel. Egypt Luxor Tour Package. Book 2 Days in Luxor City Tour and Travel to Luxor Egypt. Uncover The Valley Of Kings, Karnak and Luxor Temples Of Ancient Thebes. Book Luxor City Tour Package With Hotel, Transfers and Sightseeing Included. Book Sonesta Nile Goddess Cruise Down the Nile River, 4-Days All Inclusive Nile River Cruise Aswan to Luxor on Nile Goddess Cruise Ship One of Best Nile Cruises in River Nile For Awesome 5-Star Luxury Egypt Cruise Package. Book Luxor to Aswan Cruise on River Nile On The Oberoi Zahra Luxury Nile Cruise. Enjoy 6 Day Egypt Cruise Holidays All Inclusive For Amazing Luxor and Aswan Nile Cruise Trip. Cruise Down Nile River Egypt Onboard Oberoi 5-Star Luxury Nile River Cruise.